We’re a team of ASE Certified technicians, meaning that we have the experience, training, and service techniques to handle your car’s needs. Our team is focused on YOU first, then your vehicle. We understand that we’re repairing cars, but more importantly, we’re serving people. Campus Automotive in Blacksburg, VA maintains the industry’s highest standards in every category. We welcome you to come experience auto repairs and maintenance on a new level. Our expert technicians are here to eliminate all concerns about your vehicle’s performance, extend your vehicle’s road-life. Customers enjoy our industry-leading warranty of 3 Years / 36,000 Miles on all parts and labor. They can be confident that whatever was wrong with their vehicle was fixed completely by our expert technicians. But we’re not just a facility for fixing breakdowns. Campus Automotive is where vehicle owners come to avoid costly repairs altogether. It’s possible to maintain your vehicle’s original condition with a consistent maintenance schedule. The auto repair experience does not have to be stressful, inconvenient, and time-consuming. Let our team show you a better way--the best way--to care for your vehicle. Save time with our friendly professionals and avoid time-consuming misdiagnoses. Your entire repair process from start to finish is quick but thorough. It’s our pleasure to be your final solution for all auto repair problems. We encourage you to make us your second or third opinion before getting any expensive repair services. We go above and beyond to meet, and exceed, your expectations. Protect and preserve your vehicle with our maintenance inspections of all vehicle systems--engine, mechanical, and electrical. Our goals are the same as yours--safety, quality performance, longevity, and affordability. We keep an eye on your budget as well. That’s why we only provide the necessary repairs and maintenance for your vehicle. When there’s a more cost-effective way to handle your vehicle’s repairs, you’ll be the first to know. Use Our Collision Facility Next Door! Start with Campus Automotive for any of your auto repairs and maintenance services. We know how to get your vehicle on the right track. Your vehicle will thank you for choosing the right repair shop! Notice the enhanced performance, efficiency, and longevity that our customers have been enjoying for decades. Give us a call today at 540-951-7398 to schedule an appointment. You can save time by using our convenient online scheduling system. Next time you’re in the area–1208 N. Main Street–feel free to stop by. We gladly accept all of our walk-ins! Our team of experts gets the job done right, the first time. For your convenience, we offer a complimentary local shuttle service. We offer secure financing through Synchrony. At Campus Automotive we pride ourselves on keeping you and your vehicle safe. 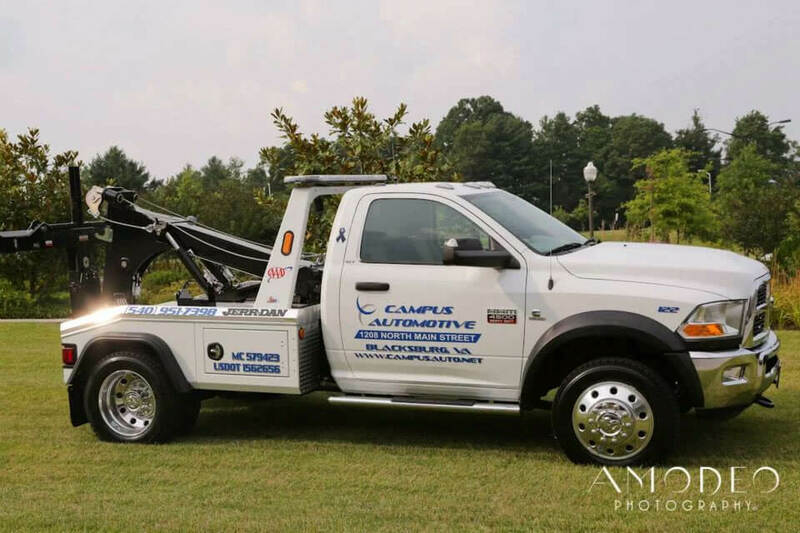 With our ASE certified technicians, you can be sure that your car is in good hands when you bring it to our auto repair shop in Blacksburg, VA. We know that you rely on your vehicle for going to and from everyday places, so rely on us to get you there safely. We were just in town for a day before heading north to see family for the holidays when we discovered a loose lug nut on a wheel. The first two mechanics we tried were chock full but a quick call to Campus put us at ease - they were willing to see us right away! We waited while they checked the lugs in the comfortable and clean waiting room. Two women from the office even came out to say hello to our dog. In less than an hour, they told us that the lugs were all right and we were ready to go. When we asked how much the service would be, they told us it was free of charge! Everything about our experience was great. If we lived nearby, we would certainly be back for regular maintenance of our vehicle. Thank you, Campus Automotive! We're Proud to Be a Goodyear G3x Dealer!